As Founder, Tom brings to 3 Peaks Consulting a wealth of diverse coaching experience. 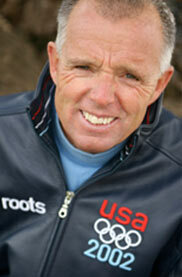 He has coached at the Olympic level in both Whitewater Kayaking and Nordic Combined Skiing through 7 Olympic games. He has also guided top CEO’s and senior executives at Fortune 100 companies. In all, his engagements have consistently raised the performance bar. Tom has worked globally guiding executives and teams to their highest level of capability and effectiveness possible. With his practical hands-on coaching style and unique performance model, executives have found Tom very successful at crossing diverse nationalities and cultures. He has worked with at the top with both Fortune 100 and pioneering companies, including StorageTek/Sun Microsystems, Cendant/Travelport, Hewlett-Packard, Orbitz, Johnson & Johnson, CheapTickets.com, Eos Airlines, Prudential, eBay, AIG, Avaya and many others. He has been successfully involved in number of mergers and acquisitions from start ups to Fortune 500. Tom has coached leadership teams and senior executives involved in acquisitions and divestitures, totaling nearly $10 billion in value. Prior to his executive coaching career, Tom was Head Coach for the US Olympic Nordic Combined Skiing Team, a sport that involves both cross-country skiing and ski jumping. Tom was appointed after the 1988 Olympics when the U.S. was looking for a turnaround after finishing dead last. When he took over, the US team had very little financial support, almost no athletic talent, and certainly no respect in Europe and Scandinavia. From that point forward, the US Nordic Combined Team went on to win its first ever medal and winning record that has yet to be replicated. Tom was awarded "International Coach of the Year" 3 consecutive times. Upon his retirement, the U. S. Olympic Committee and the U.S. Ski Team called him the most successful coach ever in the sport. Before that, Tom coached the nation's top white water kayakers through 2 Olympics. Under his careful eye, Rich Weiss became the first American ever to win a World Championship or Olympic Medal. Tom is given the credit for creating a way to break through the barriers, which had been holding the U.S. back for over 50 years.